I think I’m becoming my mother. When I was growing up, anytime we went to a restaurant, she’d find something that she was sure she could make at home and spend half the meal wondering how to make it. More often than not, all plans to recreate Applebee’s chicken smothered in cheese, tortilla strips and ranch dressing (or whatever it was that day) were forgotten by the time we reached the car to go home. But I still think of it as one of my mother’s defining characteristics. It took me a few weeks, but I did make it at home. It definitely didn’t hurt that I had gotten a watermelon as part of the haul from my dad’s garden. This watermelon was one of the best I’ve had in years. Sweet, juicy, flavorful, with that almost-but-not-quite-grainy texture that perfectly ripe watermelons have. And it had seeds, which to me is a good thing. I definitely prefer watermelon with seeds to the seedless variety. The seedless variety never seem to have as much flavor. My personal theory on this is that if they’re selecting cultivars for their lack of seeds, they can’t be selecting for flavor, so the flavor is a bit lacking in the seedless varieties. I dunno if that’s really the case, but it makes sense to me. * Not that I have anything against my mother, but I just don’t think I’d look so great with breasts and highlights. This is a really simple preparation that would be equally at home on a weeknight dinner or as part of a fancy dinner party. The ingredients are all familiar, but combined in an unexpected way that makes the whole more than the sum of its parts. 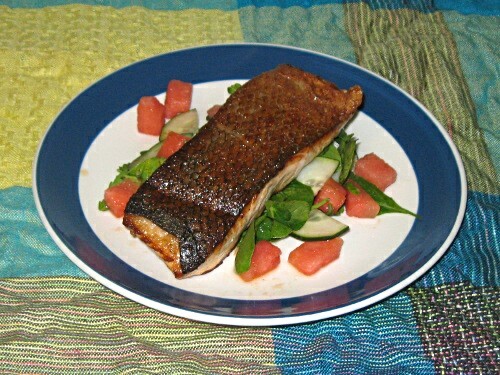 I’d definitely suggest using skin-on salmon filets. The skin crisps up beautifully in the butter and few things in life a better than crispy fish skin. Heat a cast iron skillet over high heat. Add butter, then toss in the salmon, skin side down. Sprinkle the flesh side with salt. For a warm, slightly pink center, cook over high heat for about 3 minutes, then flip and cook about 3 minutes more. Remove the salmon and pour off any excess fat. 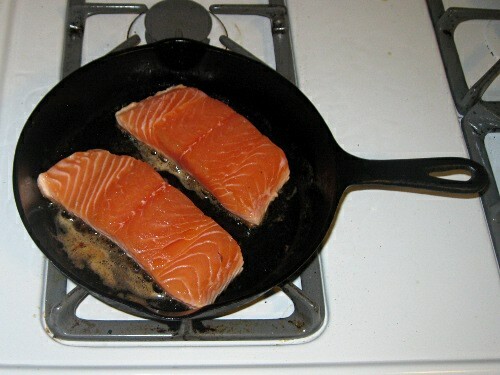 (Depending on the type of salmon you use, a good bit of fat might render out of the skin side as it’s cooking.) Turn off the heat and allow the pan to cool for about a minute. 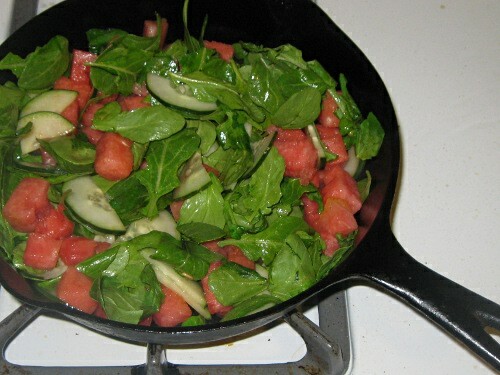 Add the watermelon, cucumber and arugula to the warm pan. Stir for about 30 seconds, until arugula is just slightly wilted, then remove from the pan. 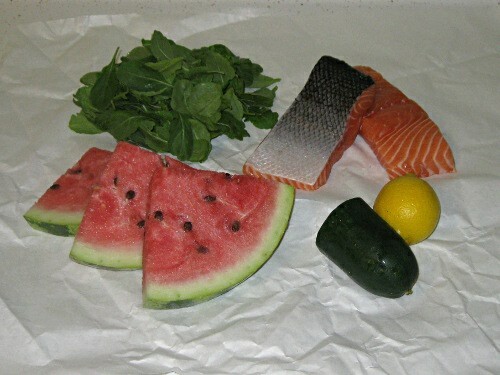 Serve the salmon over the watermelon mixture with the lemon wedges on the side. This sounds and looks really great. P.S. I am also your mom sometimes.